After our brief heatwave (45 degrees Fahrenheit) we had below zero wind chills. On Tuesday, we had blizzard-like conditions. The snow was falling and the wind was blowing the snow everywhere. It was perfect day for a warm comforting dinner. I read about Nicole’s sourdough starter at PinchMySalt I have never made homemade bread before and was up to the challenge. I needed to start my own sourdough starter, thus making this bread bowl adventure an all day thing. The time and effort I put into this meal was well worth it. My first attempt was a success! 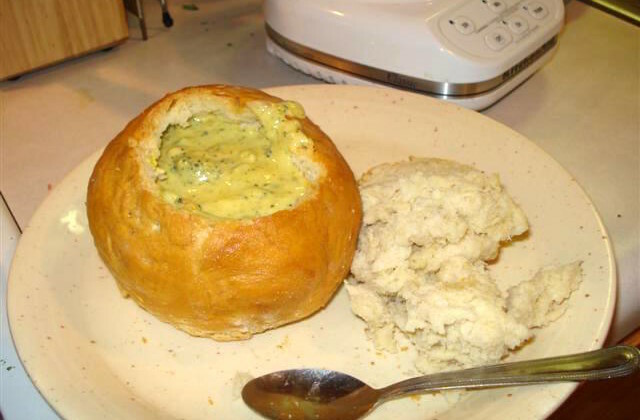 My favorite thing to order from Panera Bread is their broccoli cheddar soup in a bread bowl. I do not need Panera anymore, because I can make my own, which is just as tasty! I found a recipe for sourdough bread starter at the Food Network’s website, I chose Emeril’s recipe to follow. For my broccoli cheese soup, I adapted a recipe from my great grandma Nona. My grandma worked with my great grandma to type all of her recipes into a cookbook, which we received for a Christmas present in 1997. I have referenced it countless times when I need some inspiration for dinner. I am looking forward to getting a cookbook of my great grandma Dorothy’s recipes… hint, hint. Add the flour and stir vigorously to work air into the mixture. Cover with a towel let rest in a warm, draft-free place (an oven with its pilot light or light bulb turned on works well) for 8 to12 hours. (The mixture should become very bubbly.) Use immediately or cover loosely with plastic wrap and store in the refrigerator. Preserving the Starter: Each time you remove a portion of the starter for a recipe, reserve at least 1/4 cup and replace the amount you have taken out with equal amounts of flour and water. For example, if you remove 1 cup of starter, you must replace it with 1 cup of flour and 1 cup of warm water. Whisk these ingredients into the starter until blended but not completely smooth, cover loosely, and return to the refrigerator. Also, the starter must be maintained by feeding it every few days. Refresh by removing 1 cup of the starter (give to a friend or discard it) and adding 1 cup of flour and 1 cup of warm water. Whisk until blended but not smooth. Cover loosely and return to the refrigerator. If you plan to be away longer than a week, freeze the starter in a sterilized, airtight freezer container. Thaw the starter 2 days before you plan to bake with it. Refresh as indicated above with 1 cup each of flour and warm water. Cover and leave at room temperature 12 hours or overnight before using. In an electric mixer with the dough hook, combine the flour, starter and salt, and knead until it no longer sticks to the sides or bottom of the mixing bowl. Preheat a baking stone, if available, on the bottom rack of an oven at 400 degrees F. With a sharp, serrated knife, cut a large "X" or cross-hatch pattern into the top of the dough. Over medium heat saute carrots and onion in olive oil. Add broccoli, chicken stock, soup(and water), milk, and Velveeta. Simmer on med-lo until broccoli is tender. Once broccoli is tender, scoop out about 1/2 of the mixture and pulse in a blender a few times. Be careful because the mixture is very hot! Add back to the pot and stir well. Scoop out the insides of the bread bowl and reserve for dipping. Add the soup to the bread bowl and ENJOY!